Nathan Durfee has garnered notoriety for his captivating, pop-surrealist narratives and intriguing use of color. Currently based in Charleston, South Carolina, Durfee has been heralded as the Best Local Visual Artist by Charleston City Paper for four years (2010- 2013) and has done illustration work for book and magazine publications across the country. Each of Durfee’s solo gallery exhibitions has also been met with critical acclaim and sold out almost immediately. Durfee has also recently been profiled in American Art Collector, Charleston Art and Charleston Scene magazines. A native of Vermont, Durfee pursued a career in illustration after graduating from Savannah College of Art and Design in 2005, contributing to various publications across the Southeast, in addition to designing album art and commercial promotional materials. 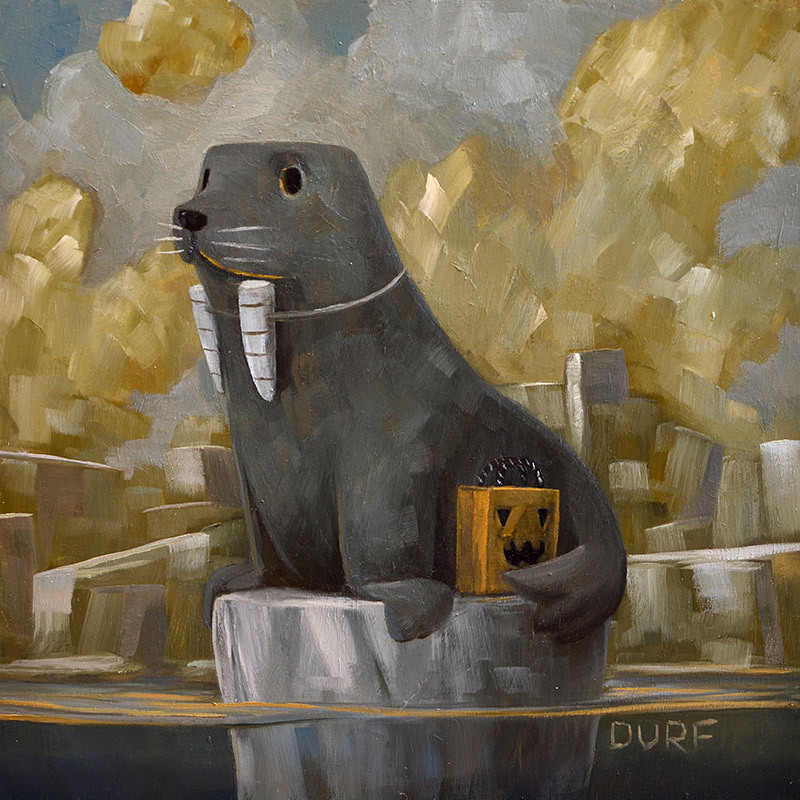 Durfee then began to explore his love of painting, creating fanciful contemporary narratives that feature an eclectic array of characters in mesmerizing and often contrasting color palettes. He made a seamless transition from illustrator to full-time painter in 2009. Each of Durfee’s paintings begins with an enormous amount of push and pull from the artist, in which ideas are refined and adjusted, until a rough idea starts to form. He then begins rendering the elements of the painting while maintaining a wandering state of mind. Many of his whimsical characters are faced with tough, yet universal decisions, conveying a sense of security in an unsure world to the viewer. He hopes to expand on these ideas and tell larger stories in his future work. Durfee continues to push himself to explore new techniques and color combinations, in addition to collaborating on works with other painters including Robert Lange, Megan Aline and Charles Williams. Collaboration not only lends to each artist’s strengths, but also creates a conversation between two styles that a lone artist would not be able to demonstrate. Durfee’s constant evolution as an artist has led to a body of work that is ever growing and continues to both thrill and fascinate its viewers.